Pete's been playing the long-awaited official English localization of Nitroplus' well-regarded, mind-bending visual novel Steins;Gate. Was it worth the wait? El Psy Kongroo. If you're a visual novel fan, chances are you have at least a passing familiarity with Nitroplus' Steins;Gate -- and if you don't speak Japanese, chances are you've been somewhat frustrated at the lack of an official localization. There's always the anime, of course, but the largely passive experience of watching an anime is somewhat different from the more active engagement that comes with playing an interactive incarnation -- even if said interactive incarnation's opportunities for interaction are relatively minimal. It is a visual novel, after all. I must confess to not knowing a thing about Steins;Gate before jumping into it earlier this week; I'd known the English localization was coming for a while, so I'd deliberately avoided spoiling myself on aspects of the plot by watching the anime or indeed reading up anything about it. For those who do know the plot already, take heart; the visual novel incarnation explores a number of alternative narrative paths that weren't presented in the anime, as is usually the case with visual novels that get anime adaptations. For those who don't, however, I can confirm that the new localization from JAST USA indeed appears to be a great way to jump in to the series. I'll say now that I'm not reviewing the game yet because I'm only a few hours into it so far. With games like Steins;Gate being so dependent on their plot rather than their mechanics, it's important to have a full understanding of the narrative as a whole before attempting to cast a thorough critical eye over it. What I can do in the meantime, however, is post some first impressions on what I have played, which will likely be enough for at least some of you to make a decision on whether or not you want to check it out for yourself. So without further ado, let's jump right in. For those unfamiliar, Steins;Gate casts you in the role of Okabe Rintaro, an 18-year old self-professed mad scientist who is afflicted with chuunibyou -- a Japanese slang term that means "middle school second year syndrome" and which, in this case, is used to refer to Rintaro's apparently paranoid delusions about being pursued by the shadowy Organization. Rintaro is humored somewhat by his friends who work together with him in his "Future Gadget Lab" in an attempt to research and develop weapons with which to combat The Organization, but in practice they all have something of a tendency to get sidetracked by peculiar projects, the latest of which is a microwave you can call with your cellphone to heat your food before you arrive back home. As the narrative develops, it becomes clear that something rather odd is going on -- after a strange incident early in the game, Rintaro finds himself remembering things that people around him swear never happened at all, which naturally doesn't help his own irrational paranoia. From hereon, it's a wild ride as Rintaro and company attempt to get to the bottom of what's happening. I haven't yet got far enough through the plot to know the truth behind what's happening -- nor would I spoil it here if I did -- but the setup is immediately compelling. Rintaro is a bizarre protagonist who frequently behaves completely irrationally, but it's a genuine delight to occupy his headspace and see his thought processes through the medium of the game's narration and his internal monologue. He's so unusual, so different from the conventional, stereotypical visual novel protagonist -- often kept as something of a "blank slate" in order to allow the player to insert themselves more easily into the narrative, particularly in romance-centric titles -- that it's always enjoyable and surprising to see what he does next, not to mention the fact that his own delusions give an intriguing feel of unreliable narration to the proceedings. Part of the game's appeal is undoubtedly coming to understand Rintaro, even if he may, at times, make you feel a little uncomfortable. This sequence from early in the game makes for a few uncomfortable moments until you realize what's actually happening. Through his sometimes (all right, often) awkward interactions with the people around him, we start to get a better feel for who Rintaro actually is and how he fits in to the world of Steins;Gate as a whole. Despite seemingly being a paranoid delusional, he appears to have a certain amount of personal magnetism; a means of drawing people to him -- and not just any old people; they're people who care about him in various ways. And what a strange and colorful cast of companions it is, ranging from the delightfully cute Mayuri through the obese computer wizard and otaku Daru to Luka, Mayuri's classmate and a person who would be the very model of Japanese femininity were it not for the fact that he's actually a 16-year old boy, a matter that Rintaro finds thoroughly confusing and difficult to deal with. One of the most immediately striking things about Steins;Gate is its visual aesthetic. Rather than adopting the usual clean, smooth, anime-inspired lines of many other visual novels -- including developer Nitroplus' own past work such as Deus Machina Demonbane -- Steins;Gate very much has its own distinctive look. Still recognizably Japanese in terms of both character design and setting, Steins;Gate eschews the standard visual novel doe-eyed look for its cast in favor of hypnotic, swirling irises and character designs whose piercing glances or far-off looks reflect their personalities extremely well. The whole thing is then overlaid with a somewhat scratched-up, grimy aesthetic as if you're observing everything through the medium of old, fingerprint-covered photographs -- or, perhaps more accurately, battered, faded drawings. It's a gorgeous looking game that immediately distinguishes itself from its peers with its unique look and feel. 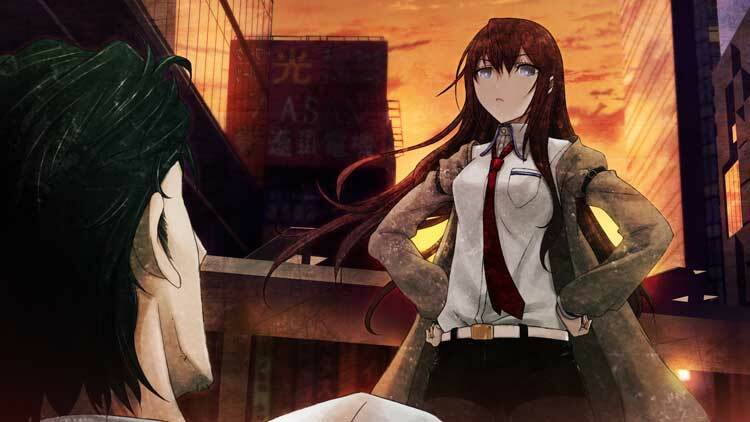 The mysterious young genius Kurisu plays an important part in Okarin's misadventures. And the aesthetic isn't the only way Steins;Gate distinguishes itself from the other visual novels out there. The way you interact with it is unique, too. 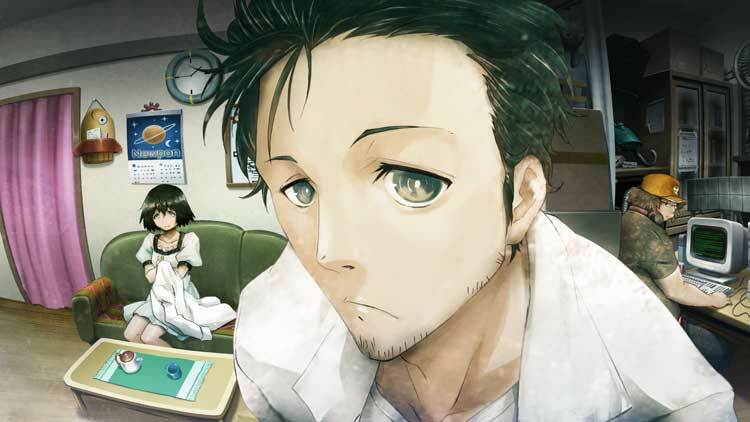 Rather than the usual approach of the story grinding to a halt at various points and you then being presented with two or three options, each of which will push the narrative down one of the available paths, all of your interaction with Steins;Gate is done in a diegetic manner through Rintaro's phone. At any point, you can whip out the device, browse past email messages, check the address book, customize the wallpaper and ringtones and even browse the Internet -- an option which actually opens your web browser and navigates to a real incarnation of Rintaro's Future Gadget Lab homepage. All this isn't just for show, however; at various points in the story, you'll receive text messages and phone calls, and the main "decision points" of the game are determined by how you choose to proceed in these situations. Do you answer the call or ignore it? What do you send in response to the message from your friend? Do you take the initiative when Rintaro is pondering whether or not to call someone up and pull out the phone yourself, or do you let him mumble away to himself until he decides that he didn't really want to make the call after all? It's a really interesting approach to interaction and while it's sometimes not entirely clear what you'll be making Rintaro say when you choose to respond to a particular word or phrase in an email, it keeps the story flowing in a pleasingly realistic manner without interrupting you to agonize over weighty decisions. It also feels a lot more natural than being presented with the binary options seen in many other visual novels, and it's doubly pleasing when you're in the middle of a seemingly non-interactive scene, take out Rintaro's cellphone on a whim and discover that it is indeed possible to do something, potentially sending the plot down an unexpected narrative path. It's also interesting that simply remaining passive in a particular situation -- choosing not to do something -- is often (though not always) an option. The last time I saw that was in 0verflow's interactive anime series School Days HQ (localized the year before last by JAST and well worth your time), which featured time-limited decision points in which the option to simply say or do nothing was usually available. Here it's implemented somewhat differently -- the main distinction being that there's no time limit in most cases -- but the principle is the same. Sometimes all you want to do is stare blankly at someone and not say anything; actions (or, indeed, inaction) speak louder than words and all that. Being set largely in and around Akihabara, there's plenty of uniquely Japanese flavor to the game -- and for those unfamiliar, plenty of Japanese otaku culture is explained in the game's thorough glossary which updates as you progress. The whole experience is wrapped up in a very complete-feeling package. There's a series of achievements designed to encourage you to check out all the possible options the game has to offer, and as you progress through the game you'll unlock entries in the glossary, which range from otaku terminology to skewed (i.e. non-copyright-infringing) references to popular culture, real-life history and real scientific theories. 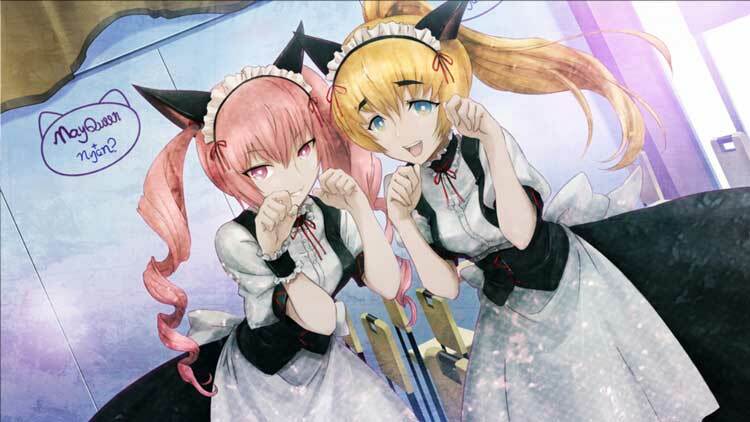 The world of Steins;Gate feels intricately crafted and extremely well-realized, even at the early stage of the narrative I'm presently at, and this, in turn, makes me eager to return and pursue it further in the hope of learning more about its cast, its setting and the peculiar things that appear to be going on. So, you know what? I think I'm going to go and do just that. In the meantime, you can find out more about the game and order a copy via the official website. El Psy Kongroo. JPgamer is USgamer's regular round-up of topics regarding Japanese games, published every Wednesday. You can read previous installments here. Tagged with Articles,	jastusa,	JPgamer,	nitro,	nitroplus,	PC,	steinsgate,	visualnovel.